The UDDI program is the first and only international program in urban design and development in Thailand. The curriculum integrates the environmental design and socio economic development of the city focusing on the integrated strategy for urban solutions. With the rapid urbanization rate, urban problems will increasingly become formidable and reflecting the needs for more integrated design and management. The program aims to equip the student with integrated built environment design and management mindset to be the leading urban design professionals with integrity and competency to take up the challenge of the urbanized world. The program is an integrated 3.5-year bachelor and a 1.5-year master’s program. The UDDI Program is divided into five distinct sets of learning experiences. In each year students will develop a new set of skills and knowledge in order to provide them with the necessary tools and perspectives to be creative and innovative leaders in the design and development of cities. A particular element of the UDDI experience is to specialize in tourism, partnerships or real estate development. The UDDI undergraduate education aims to create the graduates equipped with creativity and sufficient knowledge to take part in the various areas of urban design as well as further their specializations in specific issues in the master program. Urban Design and Development graduates are equipped with integrated skill and mindset for urban resolution which enable them to establish various career paths in environmental design and development of the city. The student with international mindset will be able to work in international environment. 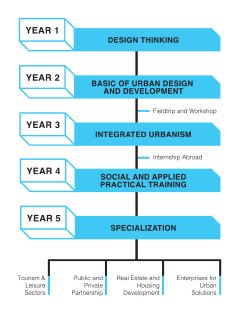 The career paths in urban design and development range in various fields. They can start their own business that tackle urban problems, social enterprise to develop service and product for the community, and being part of large scale organizations that contributes to the dynamic development of physical, social and economic growth of the city. ©2017 Faculty of Architecture and Planning, Thammasat University All Rights Reserved.